TIP: An un-stuffed turkey cooks much faster. If you love stuffing with your turkey, cook some on the side and baste with turkey drippings for that special turkey flavour. Rub turkey, inside and out with mustard. Combine all seasonings. Sprinkle mixture on turkey, inside and out. Place turkey breast-up on a rack in a shallow roasting pan. 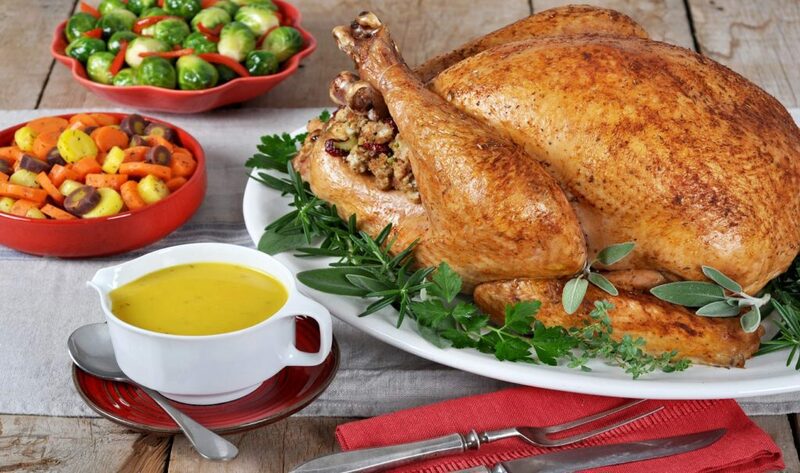 Roast turkey for 4 to 5 hours (about 20 minutes per pound) or until an instant read thermometer inserted into the thickest portion of the thigh registers 82°C (180°F). Tent with foil if needed and baste once per hour. 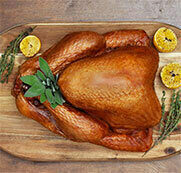 Remove turkey from oven and rest, covered, for 20 to 30 minutes until juices have set before slicing. Melt butter in a saucepan on low. Add flour. Mix with a wooden spoon until combined into a crumbly mixture. Cook for 2 minutes until mixture begins to turn brown. Gradually stir in pan drippings; simmer, stirring constantly, until mixture starts to thicken. Gradually stir in broth; simmer, stirring constantly, until mixture thickens. Stir in mustard and remove from heat. Serve alongside turkey.